Before I begin my article, I would just like to dedicate this to George, my own pet rock- We love ya, George! And to Sango for lending me her name! Oh, dear. It’s happened again; that horrible Turmaculus has once more gobbled up your neopet’s beloved Petpet with one deadly gulp and a swallow. Now you shall have to go out and buy them another one before their incessant sobbing causes the neighbors to file a complaint. But which to buy? Nothing too expensive, of course, but you want your pets to have a Petpet to be proud of! One your beloved Neopet can show off to all their little friends to make them green with jealousy! Wait, I know! The perfect Petpet for you is the Pet Rock. Don’t believe me? Alright then, here are the top ten reasons why Pet Rocks, well, rock! Reason #1: Pet Rocks are a big part of history! Many famous and historic Neopians from Brucey B to Bug Eye McGee have had a faithful pet rock standing silently by their sides. Or sitting... or whatever it is rocks do. Even Princess Fernypoo had one, though if that was a good thing, this reporter isn’t sure. Any heavy and possibly dangerous object in that Acara’s hands could spell disaster! Reason #2: Pet Rocks don’t need a lot of attention or special care. They don’t have any fur to brush like the Babaa or wash like the Meturfs do. They don’t even have a mouth to feed! (If you’ve ever owned a Gangee, you know what I’m talking about!) They don’t have any sharp teeth to brush like Charnies do or messy slime that gets all over the fine carpets like Sludgies... Enough rambling on, Kitkat! You get what I mean; a quick bath every once in a while and your pet Rock will be as good as new! Don’t you realize how many neopoints that will save you at the Grooming Parlour? That Buzz Honey soap isn’t cheap anymore! Reason #3: They are very obedient. Pet Rocks, unlike most other petpets, are born very well-trained. True, they may not come to you when you call or speak for a treat, but they never run away from you if they get loose in the yard or bark too loudly. This makes them perfect for the suburban neohome owner whose neighbors may not be inclined to hearing any barking, mewing, growling, talking, howling, or any other noises emitting from your lovely home. We wouldn’t want any complaints, now would we? Reason #4: They are virtually indestructible! You can run over them, attempt to light them on fire, eat them, or even try to smash them to bits and they will still be sitting there, looking at you with those small beady eyes! (The PPL is forcing... I mean asking me to tell you that running your pets over, lighting them on fire, eating them, and trying to smash them to bits are very much taboo in their eyes and that they frown upon such actions.) They don’t come in any edible colors like dung or custard, so they are safe from other pets’ large, hungry mouths. Disclaimer: This may or may not include Skeiths. No one really knows for sure, and George isn’t brave enough to find out. That’s very smart of you, George. 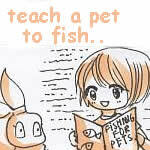 Reason #5: They are more than just a Petpet! Pet Rocks are useful for many things. You can use them as a doorstop, paper weight, stepping stone, etc. In a hurry, they could also be used a weapon against all colors but ghost! And if you are, say, stranded on a remote isle somewhere off the coast of Mystery Island with nothing to record the number of endless days you are there, your lovely pet rock can be of service yet again! Reason #6: You can use them to break the stereotype! Most people are under the assumption that pet Rock owners are strange folks who talk to inanimate objects, like rocks. What? Rocks are not inanimate objects! George talks to me all the time, don’t you George? George? Hello?!?! George says hi. Reason #7: They’re retro, and retro is in. Just add a pink or purple colored Rock, a rainbow scarf, and some shades and you’re pet will be the hippest cat in Neopia! Remember back in year two when people were sporting those handy little things everywhere you went? There was practically no room to walk without tripping over a pile of them! Remember when your friend Sango accidentally dropped hers on your foot and you had to go to the Neopian Hospital and... Well, maybe it’s not best to remember that particular instance. Reason #9: They are in cahoots with TNT, of course! After all, TNT does rock... Or at least that’s what everyone says. So they must work together; it only fits! Reason: #10: They aren’t equipped with any dangerous weapons which, believe me, is a very good thing indeed. Unlike the Wuzzle, the Chomper, or even the innocent looking Gangee, Pet Rocks aren’t dangerous at all. They don’t bite, burn, try to eat you, drool on you, or attempt to brainwash you as they try to take over all of Neopia! At least they don’t when they’re not in the hands of that Princess Fernypoo... Why is she so cranky? Maybe she needs to get more sleep.